Red Flush Casino is fairly new when it comes to Microgaming casinos, being launched in June of 2008, but they have quickly gained a great reputation. The casino is licensed in Malta by the Lotteries and Gaming Authority. Being a Microgaming casino, Red Flush offers over 500 entertaining casino games that you can play by downloading the free casino software. Games available include many different types of slots, blackjack, video poker, table games, and more. Live chat is available 24/7, which is a must for any online casino these days, and they are quick to respond to your queries. I required their help when I first signed up to play because I wasn’t given the bonus offer that I clicked on. It turned out the link that I clicked on (from a site similar to this one) wasn’t added to the website properly and part of it was cut off, so I didn’t automatically get the bonus like I was supposed to. The live chat rep was unable to give me the bonus herself, so she sent the issue to her manager or someone with more authority to investigate the issue. I was contacted by email within minutes and given the offer that I should have gotten automatically. I was surprised at how quickly and painlessly the issue was solved to my satisfaction. The welcome bonus is a multi-stage deposit bonus worth up to $1000 free. You get a 100% bonus on your first deposit for up to $200 free, then a %50 bonus for up to $100 free on your second deposit, and a 25% bonus for up to $400 free on your third deposit. You also gain automatic entry into their loyalty program along with a bonus of 500 loyalty points when you make the first deposit. On top of all that, you get $50 free every month for 6 months after signing up. 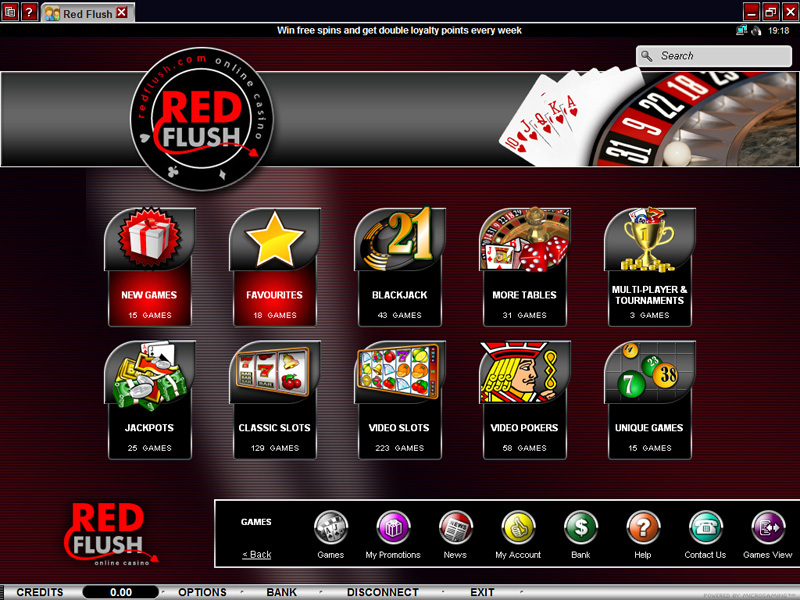 The screenshot to the left shows the Games screen at the downloaded Red Flush casino. Click the image to enlarge it for a better look. The number of games shown is current as of March 12th, 2011. Quite a few new games have been added to the selection since then, including some big names like Jurassic Park and Terminator 2. Withdrawals are processed quickly after a 24hr pending period, in which you can reverse some or all of your withdrawal to play with in the casino. Only players that have reached a VIP status can flush withdrawals on request, which cancels the pending period and greatly decreases the time taken for your withdrawal to be processed. Gaining a VIP status is very easy, you gain points for your wagering activity at the casino, and you reach different levels on the VIP ladder as those points grow. The more you play, the better the rewards. You can also redeem those points for cash when you reach a certain amount. Sign up today using either the link above, or the banner below to take advantage of the free spins offer PLUS a 100% bonus on your first deposit. You never know how much of an extra bonus you can get with those free spins. 100 free spins gives you a very good chance to build up a nice bonus.